CIOB joined forces with CIArb to put on this educational event for construction professionals and the SME businesses they represent. 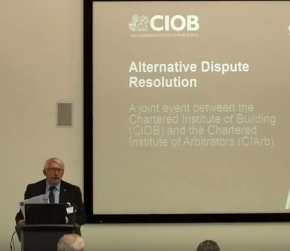 The aim of the event was to promote the benefits of using alternative dispute resolution (ADR) methods to resolve business disputes, and to equip delegates with the information they need to be more proactive and effective in their dispute management strategy. Francis Ho FCIOB, Partner, Penningtons Manches, Chair of CIOB Contract & Procurement SIG.